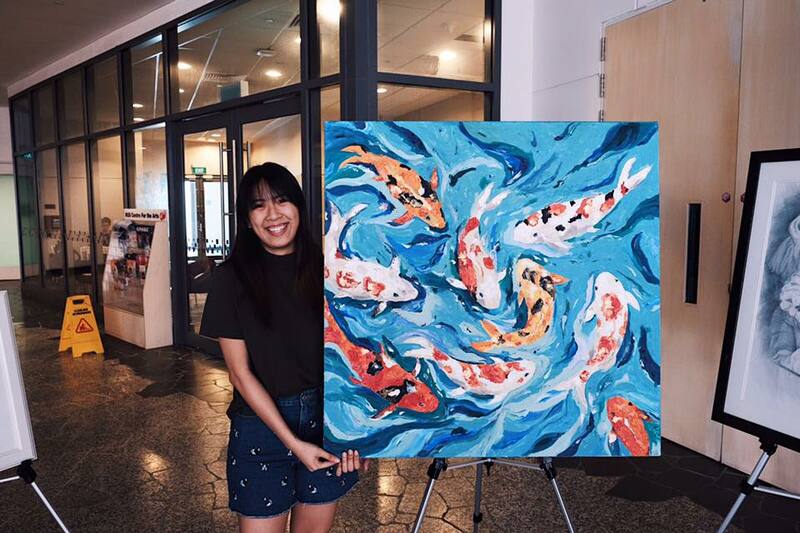 We met with Tiara to learn more about her Koi painting that was featured at heART BUZZ 2017. "Actually it was quite a random painting. There was no particular reason why I chose to draw koi. I guess that's something good about art-- you can plan as you go! The painting is acrylic on canvas with impasto gel and texture paste. Since it was around Chinese New Year, I was going for more of an oriental feel. "The earliest painting I remember painting is of a goldfish! I never actually finished it and my mum had to help me. My mum tried to expose me to art and all sorts of things. It was a hit and miss thing, and I guess it was a miss when I was younger because I didn't really paint it in the first piece. "I only started taking art seriously just before Med school began! I wasn't even intending to start painting. I was actually just waiting for a friend to finish a painting and she had a spare canvas and I decided to go for it! So I guess I still feel like quite an amateur. "To me art is a form of self expression. Maybe I'm not great at expressing myself through words but I feel like art is a medium through which you can show a side of yourself to other people in a less invasive way. Actually, a lot of the work that I do is abstract. I do consider it to be a hobby that I hope to continue even as I get busier. "I'm honestly still quite an amateur and the first time I featured my artwork was in a friend's mum's Instagram post! But jokes aside, my works have also been featured at White Coat Ceremony and DnD and I've done some commissioned work outside as well :)"